Leather pelerine is made of two parts: outer layer is of black or brown leather, and linen lining. 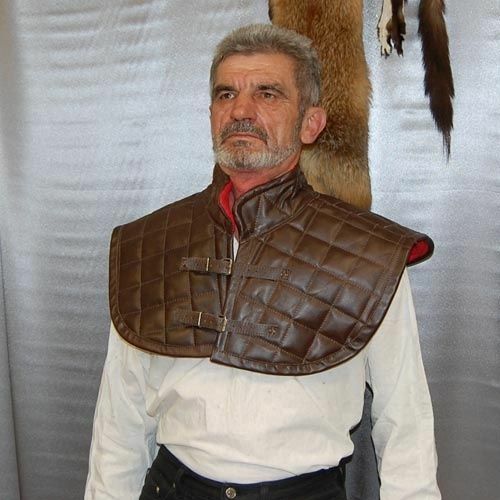 It's fastened with leather belts on the chest. Pelerine totally covers neck, shoulders and collarbones. 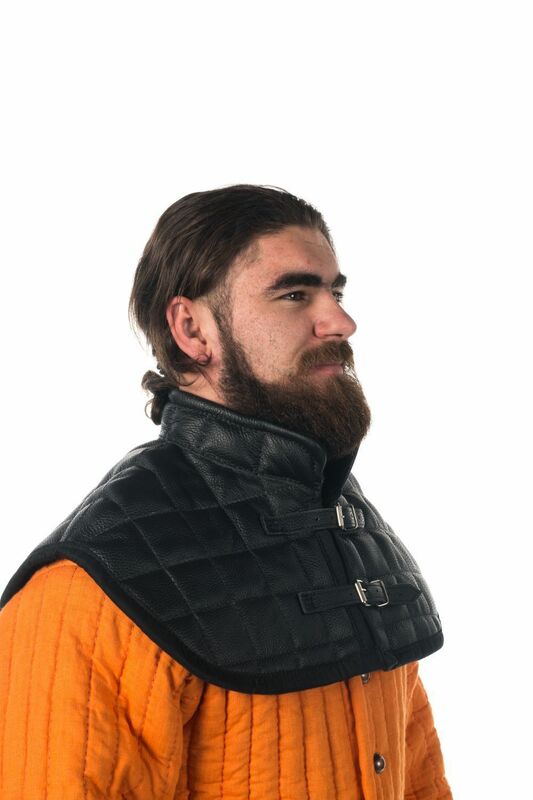 Pelerine has square-shaped padding and goes good with gambeson and brigandine for a good complex protection. 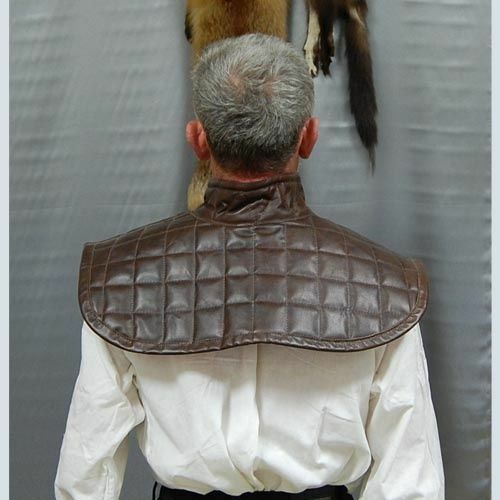 This medieval padded aventail is worn under the Bascinet or Barbute type helmet. 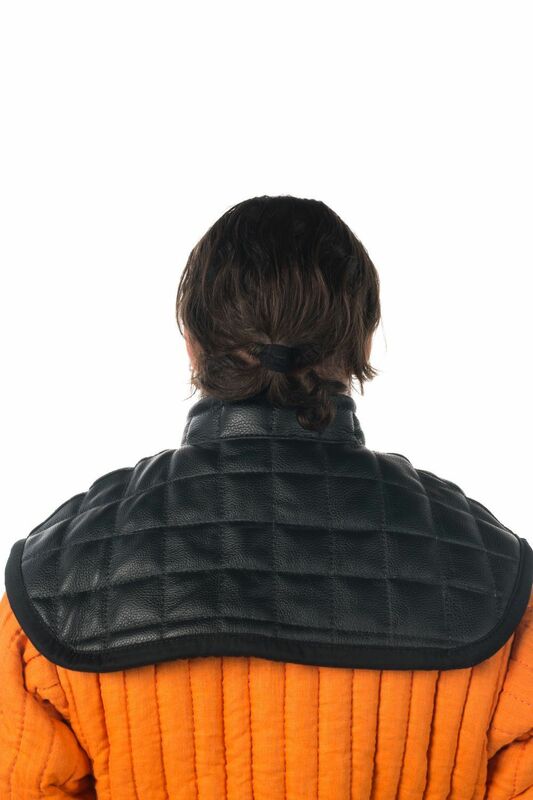 Its cut provides perfect additional protection for the shoulders and neck. High front padded part covers your chin. Aventail has lacing on the back side of the neck - 10 cm long with 4 whipstitched holes - to adjust and fix this aventail on your neck. This model is cut to fit the inclined shoulders lines and lay on breast, as well as chin covering part. It is being made of 100% natural fabrics. Different colours are available for order. .. 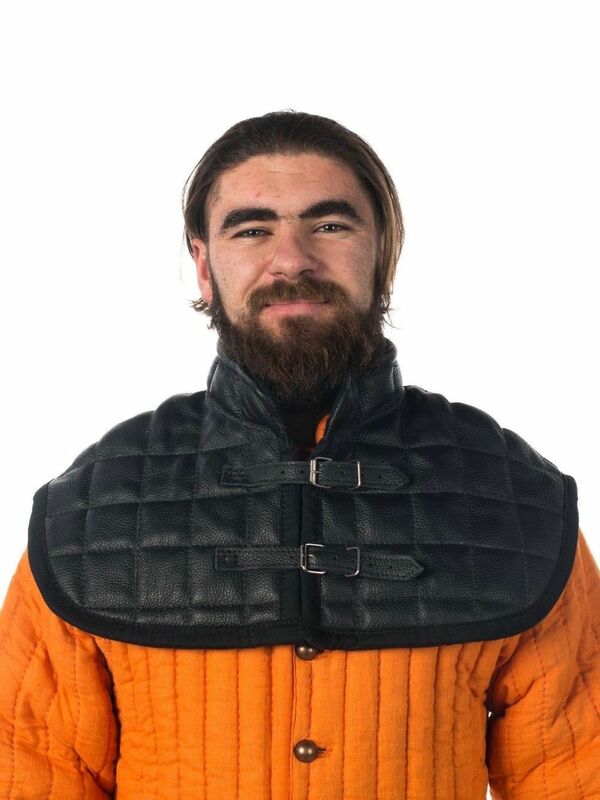 This padded pelerine is additional protection of neck and shoulders and goes good together medieval helmet, gambeson and brigandine. It shouldn't be ignored when choosing an armour. Such pelerine is not only historically corret, but is very functional. It has cross-steam padding and 2 leather belts with steel buckles for fastening. We use only natural fabrics - linen and cotton - for manufacturing. Different colours are available for order. .. Medieval helmet had never been used independently - only with additional mail or padded protection of the head, face, neck and shoulders. Usually, helmet was combined with padded aventail, that is an addition to the Bascinet or Barbute type helmet. It perfectly protects the shoulders and neck, and its high front padded part covers your chin. It is very important while using Bascinet with or without visor. This padded aventail is made of wool and has cotton lining. The lacing on the back side fixes the aventail in a good way. You can use this type of padded aventail together with mail aventail. 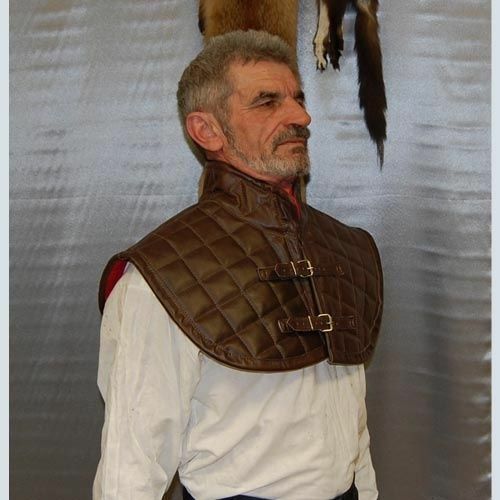 We use only natural fabric for manufacturing of medieval padded aventail. Different colours are available for order. 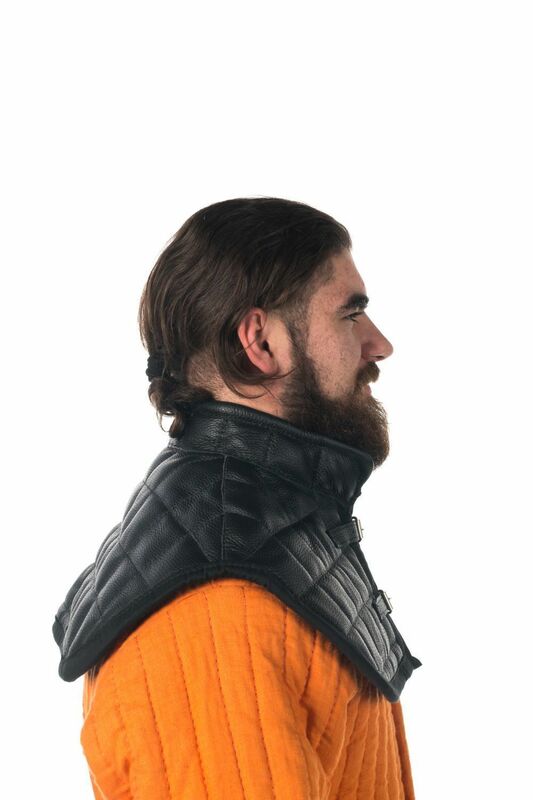 ..
We recommend you to use such padded collar for better neck protection. Padding allows taking a punch, that is aimed to the helmet's sides and back of head. The usage of such items is an important issue while armour's choosing. 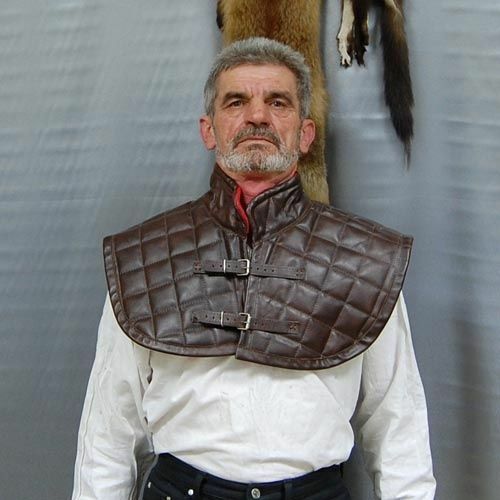 Ignoration can lead to the serious injuries during the medieval battles, tournaments and trainings. This collar is stuffed with natural sheet wadding and fastened with leather belt and steel buckle. We make such neck protection of cotton or linen of different colours. ..
Women's viking outfit "Freyja style"
Women's viking clothing "Freyja style" is historicaly correct. Dresses are made-to-measure, so the will fit you perfectly! Viking outfit consist of: undershirt; dress; hangerock; belt. The base price does not include: headwear; attire; bag; fibulas. All these itmes you can add to your medieval viking clothing as options. They will help you to make your look complete. Undershirt (medieval chemise) is made of linen and decorated with hand-made embroidery around neckline and cuffs. Dress is made of wool (not less then 80% natural wool). It is decorated with inserts of silk on the neckline and cuffs. Hangerock is made of wool (not less then 80% natural wool). It consist of 2 details and also decorated with inserts of silk. Belt is made of linen and decorated with braid. Headwear (shawl) is made of linen. Attire is made of glass, plastick and wooden beads. Bag is hand-made of natural l..